We’re urging Brighton & Hove City Council to approve phase 3 of the Valley Gardens scheme at today’s meeting (7 Feb) of the Environment, Transport and Sustainability Committee. The Council will be asked to approve the plans, which we believe are a vast improvement from those that were consulted on last year. We welcome the way that the Council has listened to residents and altered the scheme quite significantly to address people’s concerns. We believe the plans offer an exciting glimpse of the changes we could see on the seafront and in the Old Steine. For the first time ever, the seafront cycle lane will connect to Lewes Road, while pedestrians will have direct and attractive crossings and enhanced public spaces. 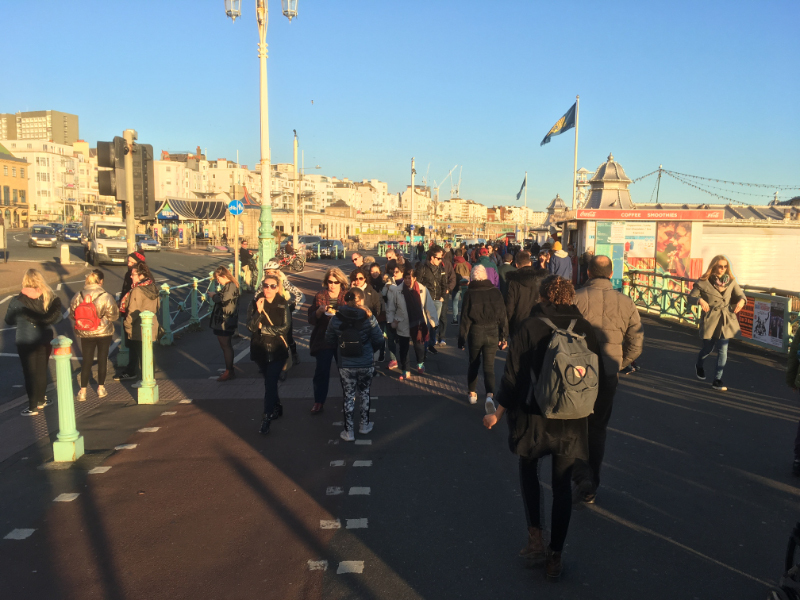 We’re particularly pleased that the promenade west of the Palace Pier will be significantly widened to ease congestion in this area (see picture above taken on a cold winter’s day). Buses will also be better accommodated with a new southbound bus lane and stops. The public consultation showed strong support for the improvements and it’s right that they should now be implemented. While some people are still unhappy, we believe many of their concerns are unfounded or exaggerated. For the last 30 years Brighton tourism bosses have predicted the demise of the economy every time some minor restriction on cars was made, yet the city remains in rude health. On air quality, the scheme shouldn’t increase pollution overall, while congestion is unlikely to be significantly worse than it currently is. Quite simply we cannot afford to keep the Aquarium roundabout and current road layout. Other cities are creating new and exciting public spaces and if Brighton doesn’t do the same it will lose out in the longer term. At the same time, health bodies have long called for these sorts of improvements to address the huge impact that obesity is placing on society and the NHS. We need to change the way we move around the city, both for our health and the economy, and this project will help kick-start that change.